Does your company’s web site work for the press and analysts that visit? How much time and money does your company spend to promote your web site, your business, your services, technologies and products to the media – magazines, blogs and industry trades? It is all wasted if you don’t have an easy to find and easy to use pressroom or press page. What happens when an editor arrives at your company’s web site and tries to find information? Can they easily find what they need or instead, do they click off, instead visiting one of your competitors to get the info they need? I have been involved with press and media relations for over 25 years – wearing both hats, and have seen and experienced far too many sites that did not work and were extremely frustrating. Your Press Room site should be an important component of your PR, sales and marketing plans. Your Press Room is open and working for you 24/7. Editors and writers often work late at night, on the weekends and holidays when your PR and marketing teams are not available. Your web site and its pressroom have to be able to provide all the info needed. So what are the Top Six Steps to Have an Effective Online Press Room? Make Your Press Room Easy to Find – It seems obvious but many company’s hide their news and press release. Even worse, some companies don’t even post the news releases at all. I don’t get it. 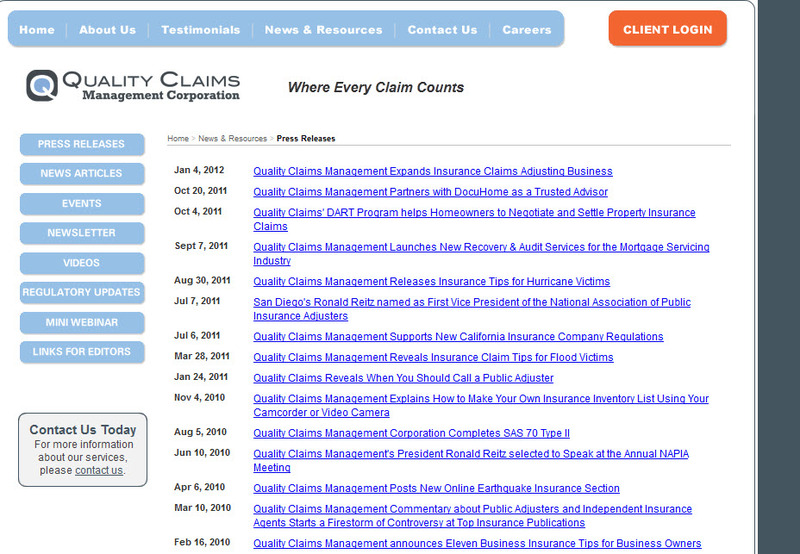 If you want to get covered by the industry press, it is essential to make your info easy to find. Good web site designs are easy to navigate. Don’t hide your press page or Press Room. If possible, put a link to it from the front page – labeling it as News, Press or even Press Room. Many companies hide it one layer down under the company info or “more about us” tabs. That’s not as good but is Ok.
You don’t want to hide the Press Room info four or five clicks away. Make sure it is listed on your web site map. In addition, for good SEO results, make the page name and file name logical. Don’t use odd symbols, letters and numbers in the file name or page title. Use a filename and a page title that makes sense like www.yourdomain.com/pressroom and “Press Information” or “Our News”! Your web site designer or website management software may give you grief but a simple, descriptive title and file name is always best. Press Release Index – Obviously you want to include links to your press releases and announcements. However, make sure the list is up to date. I have worked for companies where the last three or four months of press releases had not yet been posted. Leave the dates on the releases so that a visiting writer has an idea of how fresh your news is. Don’t require an editor to fill out a contact form to retrieve your press releases. Not only does an editor not have the time for that, they will probably just give you a fake name and phone number anyhow. I have heard marketing folk justify not posting the releases because they don’t want the competition having access to their press releases. If you have distributed the press releases and got some coverage, (which is the whole point of PR! ), those releases and info should be available on the web anyhow. Don’t post your press releases only as locked PDFs. Editors and writers need to be to easily cut and past from your press releases, data sheets and other online documents. Post them as straight text on the web page. You can provide a pdf download as well but don’t force editors to download a pdf before they can read it. They have to be able to read it online. In the same vein, do not convert your text content into jpgs and images. Instead, make it easy for the press to access and “borrow” your content in order to promote your products and services. Not only does it make it easier for writers, it also makes your site a lot more search friendly, which means better search results. Plus text is easily searchable while images are not. You HAVE to have PR contact info. It should be easily found on your Press Room page. If you operate in various regions, i.e. – US, EMEA, APAC, then list the press contacts for each area. If possible, list local phone numbers for each region. If your organization is very large with many divisions and product areas, you may want to have a separate PR contact page to make it easy for a writer to find the appropriate contact. This is important. Make sure that there is someone available to answer the emails or to pick up the phone for the press contact. A quick response to an inquiry is essential. I have seen tech companies that list a press contact email or phone number which goes to a digital box somewhere that only gets checked once every other week or so. For good PR, you need to be responsive. If an editor or writer calls, you should be able to get back to them within 24 hours or less. And, if the editor asks for some info or a document that is NOT readily available, respond back, confirm that you got the inquiry and tell them that you are working on it. Don’t leave them wondering if anyone is at home. This is especially important for companies that use a pr@domain.com address on their web site. As part of the contact area, and maybe on other pages as well, provide a RSS link and News Links so that the editors can sign up and get automatic updates to the press room and/or to recent press releases. Also provide a Public Relations List contact form to enable editors, writers, analysts to easily sign up to receive updates and new press releases. 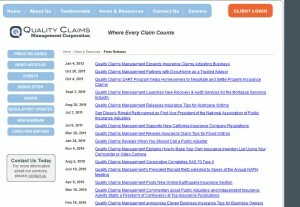 A good example is the Quality Claims Management web site at http://www.qualityclaims.com. Simple in design, the link to the News & Resources page is on the top of their home page. The press page includes a list of recent press releases as well as links to various news articles, videos and regulatory updates. Especially effective is the Links for Editors button that provides short background, the press contact, executive bios, and downloadable photos and logos. Editors and writers love photos and images. Why do so many tech web sites make it so difficult to find and download product images and charts to use in an article? If your press releases are product oriented, include a small thumbnail that links to a choice of product images of various sizes and angles. Have small gifs or jpgs for web and blog use. Have a large 300 dpi image for print purposes. If you have copyright worries, embed a small logo in the image. Video is also becoming very important. If you are using video in your PR and marketing mix, post a small thumbnail with a good description with a link to the video. You can simply link to your video posted at YouTube or you can create and use a customized player that preserves your company’s look and feel. Your video library can include webinars, podcasts, product demonstrations and b-roll, presentations and management speeches, and even commercials for your product. The writer might want to watch a commercial or a how to install it video. You never know. Despite big budgets, many big companies often have poor news and press pages. 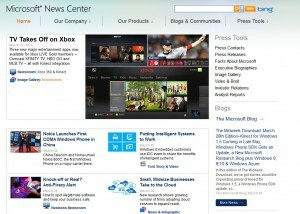 However, the Microsoft site is exceptionally well designed and maintained. 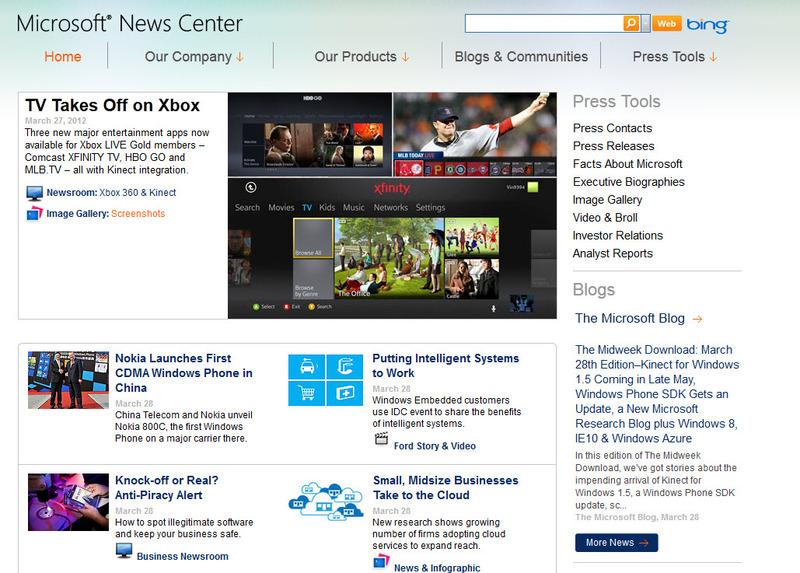 Notice the list on the right side – Press Contacts, Press Releases, facts about Microsoft, Image gallery, etc. Everything a reporter could want. Your press room should also include links to white papers, company backgrounders and corporate information, organizational history, profiles of company leaders and management, a list of upcoming shows where the company will be exhibiting or is available for interviews, etc. If appropriate, include other technical documents, product descriptions, data sheets, etc. If you wish writers to try out, review and then write about your products and services, make it easy for them to find that info. Also include relevant user and reviewer guides for easy download. If you want to position yourself as THE thought leader in your industry, your company should create and post articles, blogs, short columns, etc. about the latest trends, developments and standards that impact your industry sector. If you are in a highly technical space, you may want to create and post your own wiki or a definition of terms important to your industry. Think how powerful it is when an editor cites your company as THE source for info about particular technology, product line or industry initiative? For writers and editors, the list of press coverage demonstrates that other members of the community recognize the value of your company and its products and technologies. The press coverage page should include news articles written by third party editors and journalists, press release coverage, as well as white papers and articles that have been written by company representatives and then posted in important trade magazines. You don’t need to list every online publication that posted a copy a copy of your press release. Instead, spotlight the publications and writers that have written something over and above what was said in the original release. By creating an easy to access and easy to use online press room, your business will be able to more effectively leverage the work done by your PR and media relations group, as well as provide a modern outward looking face to the press. Don’t have a mystery site that ignores the needs of the world’s journalists. Keep the press room updated – just don’t post the releases and press coverage and walk away. Make sure new press successes are added, new product information is uploaded and maybe most importantly, make sure that all editorial inquiries are handled promptly.